Quarters Combat. The foundation of the DEFENDU method was rooted in the harsh and brutal realities of real world violence. The origin and development of this method rests in great part with the famed Lt. Colonel William Ewart Fairbairn. Fairbairn’s experience is unparalleled in the annuals of close combat. As a teenager Fairbairn enlisted with the British Royal Marines. During his tour of duty he successfully competed in and developed new methods for bayonet fighting, for which annual international military competitions were held. He also served as part of the legation guard for the British Consul in Seoul, Korea. After his discharge from the Royal Marines, Fairbairn made his way to Shanghai, China and joined the Shanghai Municipal Police force (SMP) of the International Settlement. Shanghai during this period was considered by most authorities to be the roughest police beat in the world. The International Settlement was an open “port” city that was rife with every imaginable criminal activity and vice. Tong wars, dope smuggling, murder for hire, political assassination, prostitution, kidnapping, and a host of other underworld endeavors made Shanghai one of the most dangerous places in the world. It was this violent and deadly environment that forced W.E. Fairbairn to develop effective and practical methods of survival. Fairbairn had always been considered by his peers to be a “good man in a dust-up” [fight]. His record established the fact that he was already a rough customer in close combat in bayonet fighting while with the British Royal Marines. In Shanghai however, the odds against him proved greater. While on routine foot patrol assigned to one of the notorious “Red light” districts of Shanghai waterfront he fell afoul of a group of Tong members. The Chinese Tong and their infamous “Hatchet-men” were legend for their brutal and lethal manner of dealing with any opposition. Fairbairn was overpowered, severely beaten, and left for dead. A young Fairbairn with Professor Okada. After a fairly lengthy recovery, Fairbairn was directed to the services of Professor Okada, a Japanese Jujutsu expert & bonesetter teaching in Shanghai, and at one time, personal instructor to the Emperor of Japan. Professor Okada’s school was situated in a dirty alley down which Fairbairn passed by every day for 3 years while walking the beat. Fairbairn entered into his new found passion completely, determined to never again suffer a similar fate, in great part because he realized the next time he may not be so fortunate. In the years that followed he studied and became proficient in Chinese systems under the direction of Tsai Ching Tung, who at one time was employed at the Imperial Palace, Peking, as an Instructor to the Retainers of the late Dowager Empress. 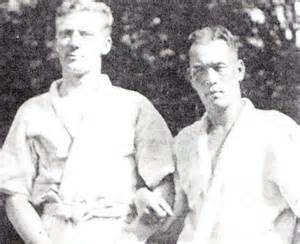 In 1918 Fairbairn applied for entrance to and was accepted by the Kodokan Judo University in Tokyo. Fairbairn received a 3rd degree brown belt in January 1919, a 1st degree black belt in February 1926 and a 2nd degree black belt in February 1931. Fairbairn’s certificates are signed by Jigoro Kano, the founder of Judo. Throughout his over thirty year career with S.M.P., Fairbairn not only made an in depth study of almost every known form of close-combat, but was also able to test these methods in actual combat against determined and often armed criminals who would rather kill an officer and make good an escape than be captured and face almost certain execution. Fairbairn rose through the ranks and was charged with the duty of instructing firearms and hand-to-hand combat. He completely revised the firearms training and instituted a method that reflected the actual conditions of real gun-fighting. In 1920, Fairbairn took an extended leave, during which time he was attached as a captain to the New York City Police Department for a ten-week period of observation. During this period he participated in everything from routine patrol duty to major gambling raids in order to absorb as much as he could. The Fairbairn-Sykes (FS) fighting knife. Reserve Unit (RU). This was the first ever Special Weapons & Tactics Unit, and served as the prototype for today’s S.W.A.T., and S.R.T. teams. Along with his friend and colleague Eric Anthony Sykes (reserve officer in the S.M.P. chief of the Riot Squad Sniper unit, and later Major with the British Army assigned as close-combat instructor for the Commandos and Special Operation), and then Lieutenant Samuel Yeaton (U.S.M.C. ), Fairbairn began work on the prototypes of what would become the most famous combat knife in the world, the F/S fighting knife. Fairbairn’s career with the S.M.P. came to a close in 1940. He retired with the rank of Assistant Commissioner. During his tenure of over three decades he had been involved with hundreds upon hundreds of violent clashes between Mao Tse Tungs communist “Red” army and Chiang Kai Shek’s “Kumontong” forces. He had seen the invasion of China by the Japanese and the bloody and brutal siege of Shanghai and the surrounding provinces by the Imperial Japanese Army. He had worked closely with the S.M.P. “Special Branch”; an intelligence gathering unit that operated covertly throughout Shanghai. It was with this tremendous amount of experience and real-world savvy that Fairbairn would enter into the next phase of his life. Fairbairn returned to England in 1940. England was at war with Nazi Germany and was hanging on by a thread. The devastation of Dunkirk, and North Africa, and soon to be felt defeat in the Far East by Japanese forces, would render Great Britain almost incapable of fighting a conventional war. It was the genius and steely resolve of Sir Winston Churchill that would pave the way for W.E. Fairbairn to once again put his talents and knowledge to excellent use. Churchill’s declaration to “set Europe ablaze” was the war cry of the neophyte covert and Special Forces operations that would strike at the Nazi forces with daring and deadly speed, guile, and audacity. Fairbairn was tasked with the responsibility of turning these men into deadly foes at Close-quarters. Fairbairn and Sykes, as well as other former Shanghai Police officers who were likewise expert in Fairbairn’s methods were assigned as instructors to various elite forces and covert intelligence units. These included the numerous Commando units, Secret Intelligence Service (SIS/MI6), Special Operations Executive (SOE), Royal Marines, and the “Paras”, as well as giving special instruction to the British Home Guard. Fairbairn and Sykes taught not only unarmed combat, and small arms, but devised a number of nasty methods for dealing with an enemy which were classified under the heading of “Silent Killing”. In March 1942, Fairbairn was ordered to temporary duty, assigned to Canada, where at the behest of the BSC (British Security Co-ordinator) he taught his methods to covert operatives at Camp X, [also know as Special Training School No. 103]. While Fairbairn was at Camp X, Sykes remained in England engaged as a supervisor to SOE personnel engaged in underground action, sabotage, espionage, and assassination in German occupied Europe. Fairbairn instructing at Camp X.
into the war against the axis powers, Fairbairn was engaged in instructing U.S. personnel at a secret training camp in Maryland, known as Area B (some suggest that was already taking place before the official declaration of war). This camp was one of several “schools” that were set up to train covert operatives assigned to the Office of Strategic Services. For a time Fairbairn divided his schedule between Camp X, and Area B in Maryland. Soon, however, the O.S.S. would have him full time. Fairbairn’s contributions to the field of close combat are numerous. Virtually every allied military force adopted his methods. 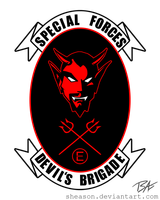 These included the U.S. Army Special Forces, Army Rangers, Paratroopers, Marine Raiders & Scouts, (ONI) Office of Naval Intelligence, (CIC) Counter Intelligence Corps), (MID) Military Intelligence Division and the First Special Service Force, also know as the “Devil’s Brigade” or “Black Devil’s”, (taught by former S.M.P. Detective Sergeant and Fairbairn’s protégé (Capt. Dermot M. “Pat” O’Neill). Another driving force in close combat during this period was Fairbairn’s U.S. counterpart Colonel Rex Applegate. Col. Applegate was given the specific job of learning all there was to learn about close-quarter combat. Col. Applegate is responsible for numerous innovations in all fields of Close Combat, armed and unarmed. His work at the Military Intelligence Training Center (MITC) which adjoined Area B is legend. As the war ended, Fairbairn was 60 years of age. In the mid-1950’s, he found himself in Singapore, employed by the Singapore Police to create a riot squad. In 1956, at the age of 71 he was employed in Cyprus, by the Cyprus Police, teaching riot work, point shooting, authoring a riot manual, and developing a bulletproof shield he called the “STONE”. It was also while working in Cyprus, that Fairbairn introduced a new knife that he had been working on for sometime, to be used for riot work. 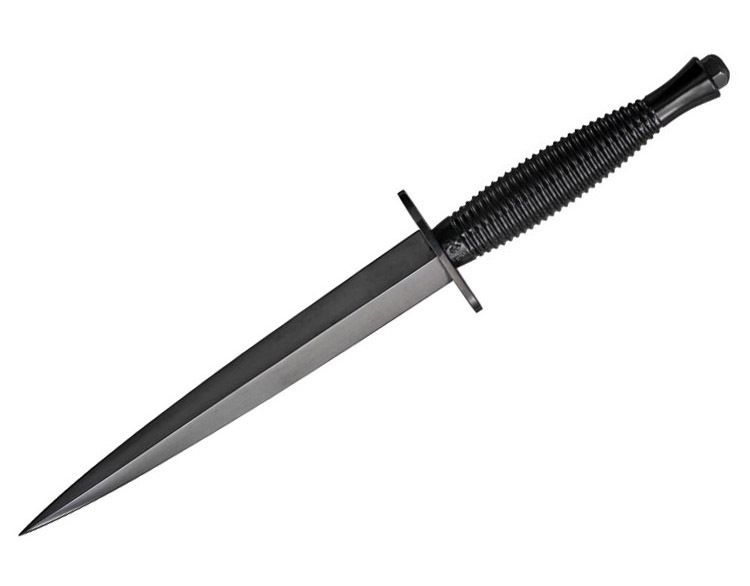 Fairbairn called his new knife the “COBRA” fighting knife. His interest in this weapon, and the system of knife fighting it supported, continued after he left Cyprus, and returned to England, and occupied his time up until his death. William Ewart Fairbairn died at his home in England on June 20th, 1960. To put it simply, Fairbairn’s methods worked. His system of unarmed combat made it possible for a person of average strength and skills to meet and win against a highly trained opponent in the martial arts. Fairbairn’s unparalleled experience with knife attacks and attacks with blunt instruments, unlikely to be duplicated in this day and age, proved a sound basis for instruction in the use of or defense against edged weapons, batons and clubs. His theories of close-quarter use of the gun represent the first systematic approach to combat pistol-craft ever devised, and remains valid to this very day. The same may be said for his riot work, his concepts of countersniping, and his development of the police role in urban combat. 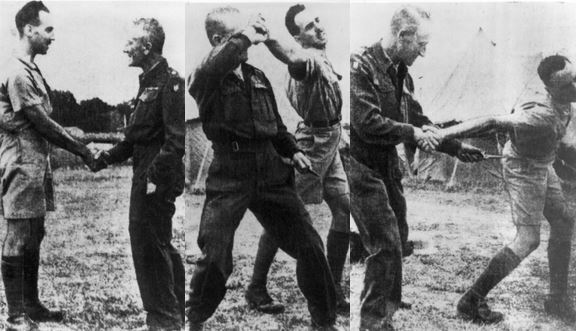 WWII was the Zenith of all methods of Close-Quarters Combat. The contributions made by these men are of enormous value to us today. Methods of close combat that were battle tested and have been proven effective under conditions of actual combat are obviously of great importance to anyone seeking realistic and effective training in personal combat. *This article was originally a public forum post by the late Carl Cestari. Thanks for sharing the backing of this effective SDT . Knowing thehistory only increase the effectiveness of it. Thank you Damian for this wonderful historical article. The beauty of DEFENDU is it’s stripped-down art of cute flows, dances and illusions, battle- and street-tested worthiness. And you can be an “average guy” or “gal” and learn it well. We all owe this man a deat of gratitude! Very interesting article …I enjoy the history of the art. What can you tell us about Jerry Peterson and his input into CQC ? He (Fairbairn) also survived over 600 non-training street fights in his lifetime as a police officer and was allegedly covered from face to ankle in scars from knife wounds he received in life-or-death battles with dirtbag criminal scumbags on the streets of Shanghai”. I understand Fairbairn was not a particularly large man, which attests to the absolute unquestionable effectiveness of his close combat techniques. Thank you Damian for integrating them into the SDTS. We are all very fortunate to have access to maybe the best self-defense training on the planet! Such an inconventional, action-packed, and life-changing story (if you’ve ever been in a near-death situation by hands of criminals or abusive bullies, you’ll easily identify with the lattermost). What always striked me as curious from Fairbairn, is that, despite being a violence-hardened man, there are accounts that say he was a humble and simple fellow, whereas others call him for a braggart guy (notice how it is said he considered his friend E. A. Sykes as his inferior). Despite all these statements, it is certain he was a straightforward and cartesian person. If you ever went through a traumatic experience, which may have put your life at risk, or left you defenseless (even in an emotional level), there’s a need to gain or re-gain confidence, and myself, as a young adult, who went through one of these experiences, I find these techniques to be, perhaps, the most useful for an snapshot of confidence (that is, of course, leaving aside their main purpose of injuring or killing somebody), since you’ll find yourself to face any harsh cimcumstance that life puts you in the way. My point is, simply, as follows: If you have the enough confidence to beat, with determination, any person which seriously tries to harm you, you’ll regard other lesser problems as such, lesser problems, which you can easily overcome. My humble word, as a university student, is that, whichever you are, a learner of martial arts history, a martial arts practicant, a person who went through a very discouraging experience, or a person who seeks to gain more confidence to face life, chin up, dedicating some time to learn about Fairbairn’s Defendu (or System, if you’re a military or military aspirant) is definitely one of the best experiences you’ll have; I am constantly reading about him, and one time, his Scientific Defense book. Thank you very much for the article; I found many details I didn’t know about him. Errata and clarifications: In line 2 from the text, the chances of getting killed by bullies on purpose are, perhaps, non-existant, but mostly high, if it is accidentally; in line 5, we cannot simply affirm he was a cartesian person in all aspects of his life, but in relation to seeking opportunities to getting out alive from a fight, we can say it is certain, so as being straightforward (when teaching his techniques); In line 11, instead of “an snapshot”, it should’ve been ” a snapshot”; In line 18,instead of “Scientific Defense”, it should’ve been “Scientific Self-Defense”. Please, overlook the capital letters after the semicolons. 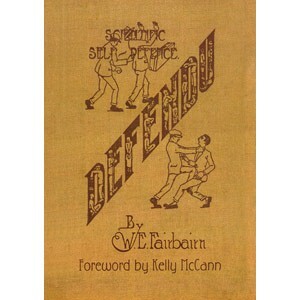 Hey Buddy!, I found this information for you: "History of Self Defense: Fairbairn’s Defendu". Here is the website link: https://www.myselfdefensetraining.com/history-of-self-defense-fairbairns-defendu/. Thank you.